“Not so fast my friend on your Moment of Truth blog post”! Never thought I’d quote Lee Corso. Well it snowed on May 1 and KC Royals are 1st. Maybe the Mayans we’re just slightly off? 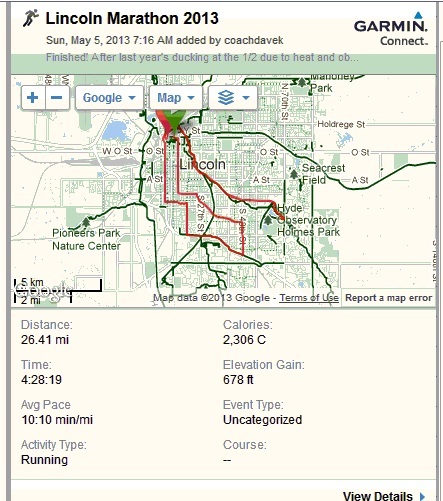 4:28 (10:06 mile pace) versus 4:00 (9:06) – not a good trade between the Lincoln Marathon 2013 and 2011 versions. The weather may have been a tad chillier today, wind stiffer, but still a noticeable add. On the positive side this was the 7th of 9 Lincoln Marathons – better than 2009/06 and close to 03. Here’s the Garmin Notes and Quick Assessment. Finished! After last year’s ducking at the 1/2 due to heat and obsession with time, focused on just finishing. 2:06 front half, 2:22 back. Rain held off, but cool low 40s day with a stiff N/NW wind. Felt it the most mile 21-24 until we hit the trail again. Quite a bit off PR of 2011 (4:00), better than 09 and 06. Close to 03. Off the ‘golden years’ of 94-96. I’ll take it! Quick comparison to 2011 programming. Same intensity on CrossFit (probably more) and better swimming. I jumped into the CrossFit Games Open – intense 5 weeks of WODs close to my maximum strength or beyond. Sort of zapped some of that March running ramp up. I’d do again in a heart beat and will next year, with the added benefit of continued strength. Not nearly as much Track or Hill work. This likely loomed much larger than I thought or gave credit. The endless Winter sort of sucked out the momentum or time to crank out serious speed sessions at our track places (East or Northeast). Good swimming practices in January – February supplemented, but missed that critical 7-8 weeks from late February to late April. Ditto on serious hill work. Is that anaerobic work beneficial for marathons? The debate continues. It’s spot on for 90 minutes or less (especially 5-10k)! Volume was 253 to 383 or 130 less (17 per week versus 26). I’m not a mileage hog but some quality volume is needed, even on the 3 per week approach from Hanson’s Approach or Runner World’s Run Less. 2011 Weight was 166, 2013 was 168 – a wash (2002-08 was 178-180s). Could see what a skinny model weight might do? Last Fall before the 4:11 repeat at Des Moines (w/in 21 seconds of 2010), running volume much higher, intensity higher, strength training was much less last Fall (2 days compared to 4 per week). So what? Scrap approaches, punt or be happy? I’ll go with door #4 – tweak a bit. Continue the strength intensity and bring back the volume and intensity of running – back to the 3 intense runs a week and equivalent aerobic (swim/spin/bike) on 1-2 other days. The strength saved me today but could not overcome the lack of volume. And be happy! Not many people bite off a marathon on 17 miles of running a week. Lincoln Marathon 2013 by coachdavek at Garmin Connect – Details.